As it gets colder we start spending less time on the details in our state of hibernation, but the as the weather changes so does our skin! Winter is the time we need to give our skins some TLC and lost of nourishment. We can help! 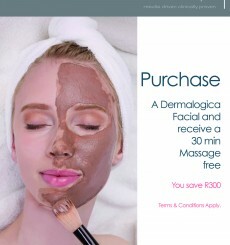 Treat yourself to a 60min Dermalogica facial and receive a Complimentary 30min Back, Neck and Shoulder Massage. Don’t miss out – If you snooze, you loose….